I Love Py [UPDATE: now I Love Paraguay] is a friendly cafe in Sunnyside with owners from Paraguay, only one of two eateries in the city that I know of from the country [UPDATE: This is now the only remaining]. The interior is bright during the day and while not exactly a hotspot of decorating tips, it remains very comfortable to enjoy a quick bite or coffee. When the Spanish first colonized South America, upper and middle classes of Spanish-speaking people took high positions in what was modern day Paraguay while indigenous Guaraní people and language were looked down upon. This will completely oversimplify the history, but over time the language has become something of a national identity for Paraguayans, and is one of two national languages of the country. The language is seen a lot throughout the land, with words being intermixed with Spanish easily. They also do this at I Love Paraguay, with Guaraní on the walls and menu. 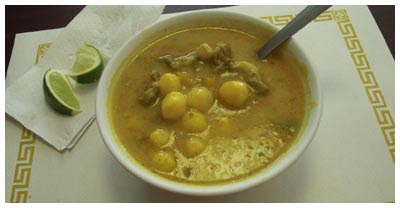 Many of the dishes use the Guaraní name and then are explained in Spanish and English. 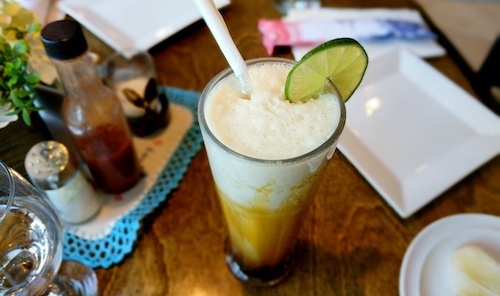 For a unique Paraguayan experience, try the aloja ($5.50, below), a refreshing citrusy drink with lime and black honey. Do your best to mix it up, but try to drink from the middle to avoid super sweet sips of honey. In Paraguay there are many types of chipa, the majority of which you can find from street or roadside vendors. They come in bags or on a stick. 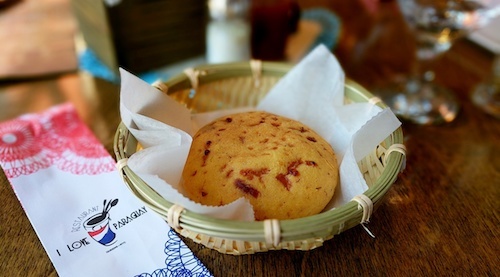 The chipa so'o ($3.50, below) is a style that has egg and ground beef inside of a salty corn cake. It is a bit on the dry side, so make sure your water glass is full before starting. Vorí vorí ($6.50, below) is a delicious introduction to the cuisine, a chicken-based broth with potato puree and many corn balls. Vorí is the Guarani deviation from a Spanish word meaning "little ball" and saying it twice just signifies that there are many. They taste more like the broth than corn, and are just a bit chewy. A piece of meat is also in the soup but is mostly bone and probably just there for seasoning, as with the bits of carrot. Squeezing the two slices of lim is recommended to give the soup even more life, and a tart counter-taste to the not overly salty broth. 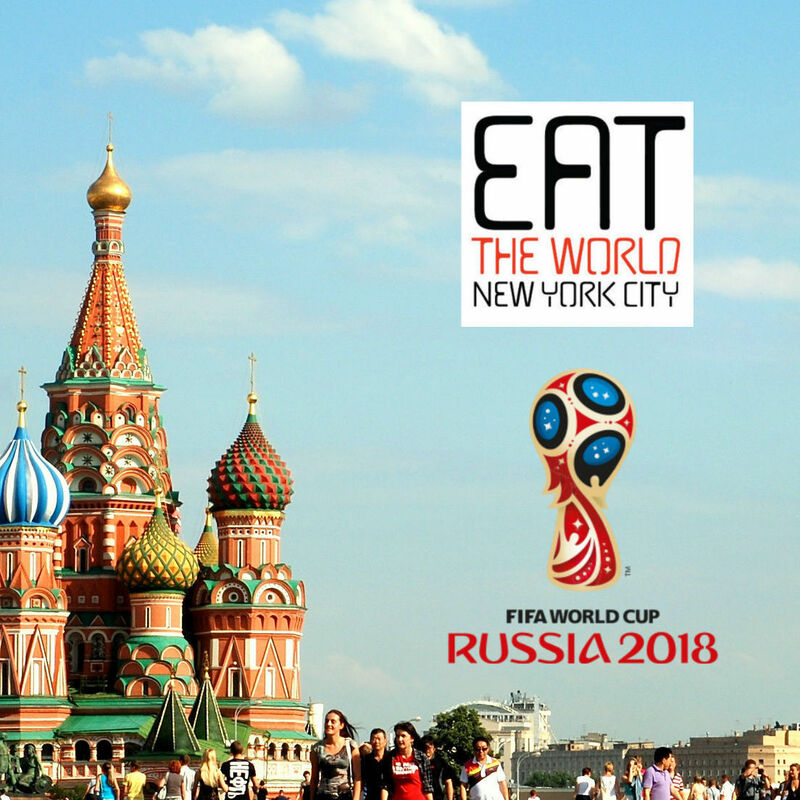 The menu now reads much more thorough than back in 2009 and more unapologetically Paraguayan, which is to say it is also a mashup of the countries it sits in the middle of in South America. 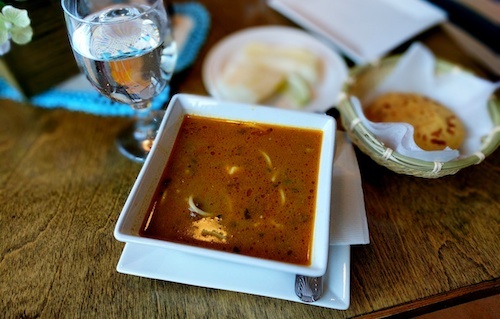 There is still a rotating daily traditional soup, the vorí vorí is available on Tuesdays and Saturdays. On a return visit, I tried Thursday's kumanda so'o, a soup of beans and beef shown below. 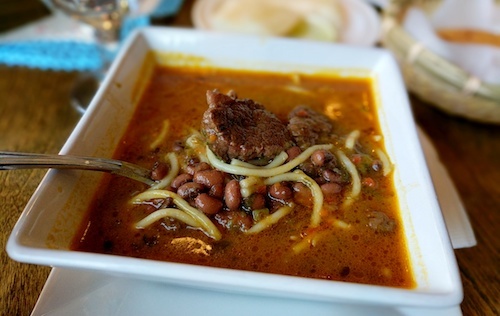 The small tasty red beans are the focus of the soup that also includes cuts of beef and spaghetti. It is rich and warming, good for a cold day for sure. 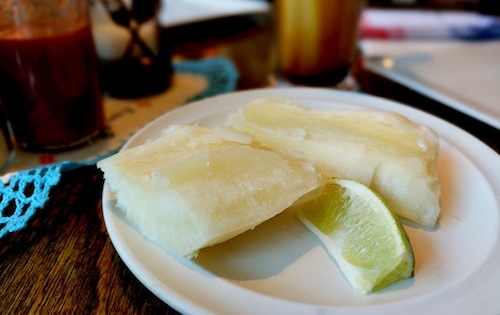 A side of yuca comes with the soup, to be eaten alone or added as desired. Make sure to squeeze the lime onto it and into the broth. On each table is a bottle of unlabeled hot sauce that seems to be homemade. This works with the chipa or in the soups as well. 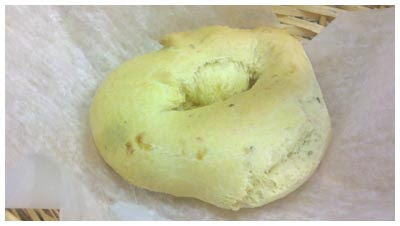 The chipa almidon ($1, below) might look like bagels or donuts, but are much more savory and chewy. Available plain or in a few varieties, it is a very Paraguayan treat. While eating, a few customers came in for takeout orders, buying boxes of cookies or other Paraguayan packaged goods with their meals. 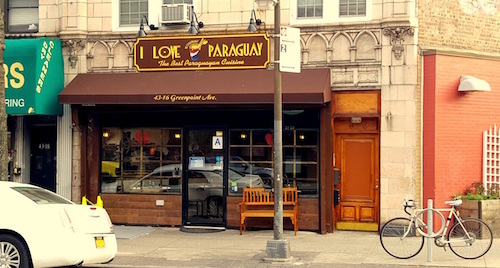 This combination of excellent food, drinks, and grocery items from back home make I Love Paraguay a hub for the small community here in New York City. 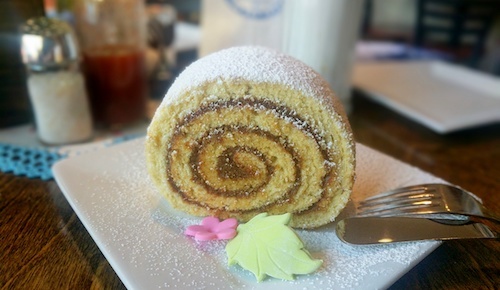 Don't overlook the desserts as well, including the lovely pionono ($4, below), a cake swirled with dulce de leche. On the walls of the restaurant are various scenes from Paraguay and facts about firsts and famous folks. The pride is obvious, and it is fun for a "traveler" of the city to come here and be amongst the people and this pride.